The WV Chapter of Alzheimer’s Association is celebrating a Reason to Hope Breakfast at the Charleston, WV Marriott on April 25, 2019 beginning at 8:00 a.m. Please RSVP by April 15th. There is NO CHARGE to attend. 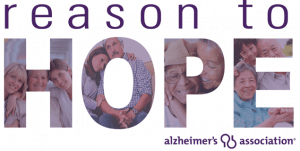 Reason to Hope is a celebration of family as they honor those living with Alzheimer’s disease and their caregivers. Guests will hear about the strides being made in Alzheimer’s research and a powerful testimony from someone impacted by the disease. This inspiring event will bring the community together to learn about the impact of Alzheimer’s while gaining understanding that we all have reason to hope. The mission of the Alzheimer’s Association is to eliminate Alzheimer’s disease through the advancement of research; to provide and enhance care and support for all affected; and to reduce the risk of dementia through the promotion of brain health. Call Nikki to learn more. 304-343-2717.